Metro Transit has unveiled an updated draft plan for Metro Reimagined, and we know it’s a popular topic for you. To help address any questions you have, we’ve put together a list of the most common questions we’ve heard. Q: Remind me what Metro Reimagined is again? A: Metro Reimagined is an in-depth study of the Metro Transit system. Using research along with feedback from you, we’ve perfected a draft of a new transit service plan that’s designed to provide new and existing customers with faster service, shorter wait times, and more reliable connections. Q: Why do we need to change the system? A: We need to adapt so we can provide you with services that meet your travel needs. In recent years, MetroBus ridership has been on the decline for the past several years, as is the case for most transit agencies across the country. While there are always a variety of factors that can impact this number, one thing is clear: the Metro Transit system, as it is today, could work better for the St. Louis region. Q: What are the highlights of Metro Reimagined? A: The draft plan will increase frequency to the 13 most-popular MetroBus routes (these routes accommodate more than half of today’s MetroBus ridership in Missouri) so that they would arrive at bus stops every 15 minutes or better. Most other MetroBus routes would be upgraded to 30-minute frequency. The draft plan also provides faster, more direct trips and new transit technology options. In addition, for the areas in the region where a 40-foot bus isn’t the best way to move riders, we are looking at new options to provide better service – options like smaller vehicles, shuttles or on-demand services. Q: What were the results of the first draft plan? A: The results from the first draft plan of Metro Reimagined were extremely helpful. We received over 1,200 public responses to the online and print surveys and received over 1,000 comments on the plan. With this feedback, we revised the plan to address concerns about gaps in service. Q: How much will this plan cost? A: The enhancements from Metro Reimagined will be supported using Metro Transit’s existing operating budget. Q: This plan means I may have to transfer more often. Is this true? A: Yes, you may have to transfer; however, your overall travel time should be reduced. In order to provide faster trips, better connections and add additional frequencies, it won’t be feasible to operate buses on every street. Instead, the new system is designed around simpler, straighter lines that are more useful. Q: How would this plan impact weekend service? A: The draft plan aims to run the same level of service on Saturday as it is on Sunday. This means routes that only served riders on Saturdays will now serve riders on Sundays too. Many riders will get weekend service for the first time. Q: How does this plan address bus shelters and other bus amenities? A: Metro Transit will continue to work with its partners and area businesses and municipalities to enhance the transit experience. Under the draft plan, Metro Transit will work with local jurisdictions to coordinate streetscape improvements and other needed customer amenities. Q: What MetroBus routes will be cut under this plan? A: Metro Transit will continue to serve all areas of the St. Louis region – but the system will look different under the proposed plan. We are working hard to minimize the impact of these changes, but you may need to make adjustments to your commute. However, with these changes, you will have a faster, more reliable transit system with more frequent service than you enjoy today. And for the majority of riders, your current commute should take less time overall under the proposed plan than it does now. Q: How does Metro Reimagined address safety? A: The draft plan includes shorter wait times at bus stops, and coordinated connections between buses and trains. This means we can deliver you to destinations faster and safer. Metro has introduced new technology to help you feel safer and more secure while on the system. For example, riders can now text Metro Public Safety directly anytime for assistance. Q: Why doesn’t Metro Reimagined address MetroLink expansion? A: Metro Reimagined is designed to be implemented in the short term. As a result, it focuses on how to make the most of existing resources and infrastructure. Furthermore, rail infrastructure is a separate conversation and ultimately rests with regional leadership and the East-West Council of Governments. 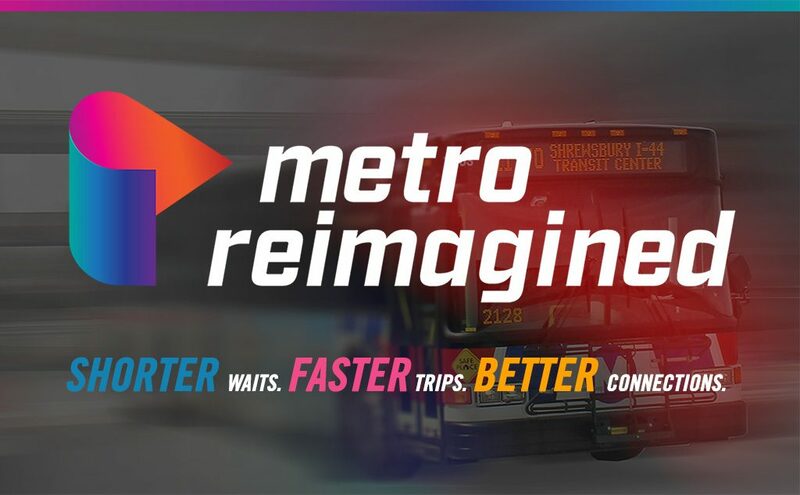 While there are no direct improvements to MetroLink under Metro Reimagined, the plan will improve connections between MetroLink and MetroBus, creating a better transit experience for all riders. Q: When will changes go into effect? A: We’ll be accepting public comments until the end of the year, and then incorporate changes to finalize the plan. We anticipate rolling out service improvements and network changes in phases. While most of the planned changes will not occur until later in 2019, some shorter-term implementation activities could include: conducting demonstration projects of new service types, introducing new technology and customer amenities, as well as new vehicles to our fleet; beginning to make adjustments to some bus routes. How do I provide feedback on the plan? A: There are several ways you can share your thoughts and comments about the draft service plan. Hi. On the #56, I know it is proposed to run on Sundays as well. I want it to run every 30 minutes on all 7 days. But the reason why I say that is because church services have different starting times. 30 minutes on all 7 days will draw ridership. 60 minutes apart will kill it. Appreciate the feedback Patrick. We’ll make sure this is incorporated in the planning process. I travel to downtown Kirkwood from the Community College, right now rout 56 takes 10 minutes to get to Kirkwood Road and Adams. I do not see how the changes will made the trip quicker when have to take rout 21 and transfer to the new rout 50, which will take me out of my way. Michelle, currently the #56 Kirkwood-Webster operates with frequencies that range anywhere from 25 minutes to 60 minutes during the weekday. Under the Metro Reimagined draft proposal, the #50 Lindbergh as well as the #56 Kirkwood-Webster and #21 Watson all will have 30-minute frequencies (or less) during most of the weekday. These routes would also have both Saturday and Sunday service. Currently, the #56 Kirkwood-Webster does not offer Sunday service. Under the draft proposal, you would have to transfer to the #50 using the #21 or #56 from St. Louis Community College. That being said, this is a draft proposal. Things can change. We’ll make sure your feedback is sent to Customer Service to be incorporated into the planning process. Thank you Michelle. Vanessa, I want to stress that we are still in the planning phase for the Metro Reimagined service plan. We are still accepting feedback regarding this current proposal. I encourage you to reach out to Customer Service at customerservice@metrostlouis.org so that your feedback can be incorporated into the planning process. Thank you. Currently, I ride the 174X to get to work downtown. I get on at Riverview near the circle and it takes approximately 22-25 minutes to get downtown. I don’t see how replacing the #174 with #84 will be more quicker. For me, this will mean catching 2 buses instead of one which will also mean a much longer ride to/from downtown. If I take #41 to downtown, it will take 45-60 minutes and that’s not feasible for me. Or I would have to take #41 to the Broadway Transit Center and then take another bus to get downtown! So tell me again, how much more efficient and quicker this new bus route will be when I can take the #174 to get to work and back home in 22-25 minutes each trip! I don’t think it’s feasible to take away the 174X. Does any of the people making these decsions even ride MetroBus or the Metrolink to see first hand how and if they run on schedule? If not, maybe they should try riding Metrobus or Metrolink for a month before thinking about replacing anything! It’s just a suggestion to get the REAL feel of what Metrobus and Metrolink riders encounter on a daily basis. Thank You. Lynn, thank you for providing your feedback on the Metro Reimagined draft plan. I’ll make sure your thoughts are forwarded to Customer Service and are a part of the planning process. Instead of walking a block to the nearest bus stop, I will now have to walk over 3 blocks, up a hill and across a dangerous intersection daily to get to the bus which will still take just as long, if not longer, to get me to the MetroLink so I can make it to work on time. Thanks so much for hearing my concerns! Will I just attempt to catch the #8 bus one day and it just show up? Will there be clear signs and announcements that show when this change is supposed to happen? Riders need to know well in advance so we can adjust our commutes (and if possible entire schedules) accordingly. I keep hearing “sometime in 2019” but this isn’t good enough. We need set dates! Hey there! Metro Reimagined will be finalized sometime in early 2019. After that, we anticipate rolling out service improvements and network changes in phases. These phases will be advertised through Metro’s digital and traditional mediums well in advance of implementation. While most of the planned changes will not occur until later in 2019, some shorter-term implementation activities could include: conducting demonstration projects of new service types, introducing new technology and customer amenities, as well as new vehicles to our fleet; beginning to make adjustments to some bus routes. Please rethink about keeping the #8. I’ve had many recent hardships and depend, rely on the #8 bus. I found a job because the #8 goes right by there and it’s only a block away from my house. I depend on the #8 for work, grocery shopping, and getting downtown without having to transfer a couple times. It’s the perfect route for many people. PLEASE rethink this. PLEASE SAVE THE #8! I reviewed the draft of the planned Metro Reimagined. It appears that the New #77 will take over the portion of the #37 north of Frost Av., beginning at the 9C exit ramp, off of I-170 in Berkeley. The New #77, traveling on I-170 will be bypassing the intersection of N. Hanley Rd. and Airport Rd., which is a major transfer point between the #37 and #61. Passengers would have to potentially backtrack and travel an extra three miles to the N. Hanley Rd. Station in order to make the connection between those two bus lines. That would be inconvenient for the passengers trying to make that connection, as well as increasing the travel time in order to make that connection. Therefore I’m proposing that the planners consider allowing the #77 run the entire route of N. Hanley north of the Station. In addition, the convenience and safety of the residents residing in the Windsor Townhome Apts. would be compromised because of the dangerous intersection they would have to cross to get to the replacement bus stopsfor the new #77 route. There is a good number of the residents of Windsor townhomes that patronize the #37 bus. Mike, thank you for taking the time to explain your commute (and the commute of your fellow riders) to us in great details. This is extremely helpful for our transit planners to review and – if possible, make modifications. I’ll make sure this is sent to Customer Service to be included in the planning process. Thank you again for your thoughts and concerns. In following up to the frustrated commuter’s comment, will the announcements for these changes be made in form of notifications posted on flyers to bus stop, on buses, etc.? Mike, those details have yet to be finalized yet. However, judging from past experiences, what I would imagine happening is a phased approach. It’s just not feasible to change the system overnight (we just don’t have the manpower). Before all this happens, Metro will make sure to provide sufficient notice using our digital and physical communications tools. These include: Rider Alerts on board trains and buses, signage at affected bus stops and information on the Metro website. Thanks for the info Matthew. On the #90 Hampton, the plan noted that the service route will be changed for Hampton-Gravois to Forest Park-Deballivere, then from Forest Park up to Riverview. What does that schedule look like? I take this bus every weekday for work from south city up to north county. The ride is already nearly an hour without any transfer. Do I have to switch buses now at Forest Park? What change am I looking at through this plan? Linda, under the proposed plan, the #90 Hampton will operate from the Hampton-Gravois Transit Center in South City, connect with the Forest Park-DeBaliviere MetroLink Station and terminate in the north at the Riverview Transit Center. Portions of this route (specifically the portion north of the Forest Park DeBaliviere MetroLink Station) will see 15-minute frequencies during most of the day. It all depends on where you board the #90 Hampton. For example, if you were to board the #90 Hampton at the Riverview Transit Center in north St. Louis, there will be buses that terminate at the Forest-Park DeBalivere MetroLink Station and return to the Riverview Transit Center (15-minute frequencies). The next #90 Hampton to leave the Riverview Transit Center would then go straight to the Hampton-Gravois Transit Center (30-minute frequencies). Does that make sense? I’m happy to clarify anything for you. Will the 90 Hampton no longer service the Catalan Loop? I catch the #90 at the Southwest Crossing Apartments at Germania and 55. What bus are we to catch if the 90 stops service at the Hampton-Gravois Transit Center? Erica, under the Metro Reimagined draft proposal, the #90 Hampton will no longer serve Catalan Loop, but rather terminate at the Gravois-Hampton Transit Center. You would instead have to transfer to the new #9 River Des Peres at the transit center to continue south to the Catalan Loop. The #90 Hampton 15-30 minute frequencies during most of the weekday whereas the #9 River Des Peres will have 30-minute frequencies. Eliminating the #39 could result in a real hardship for riders in the areas of North St. Louis County that this route currently serves, which are already transit deprived and economically depressed. I observe #39 buses with sufficient passenger loads passing through Berkeley on a regular basis, which would rule out eliminating the 39 route because of low ridership. In addition, I would hate to see elimination of this route which serves a high school, in this case Hazelwood Central, in which students may rely on, for getting back and forth to school. If the #39 is eliminated, I would suggest in the area of Old Town Florissant where the #39 currently serves, with current plans of partially being replaced by the New Route #67, instead of the New #67 terminating at St. Ferdinand and Washington in Old Town Florissant as planned, the New #67 could instead take over where the #39 currently runs at that point, and proceed on the current #39 route to the North Hanley Station, in order to continue to provide direct bus service from that part of Florissant to the North Hanley Station. I take a wary eye to service cuts when you’re potentially looking at the end result of losing passengers in areas currently being served by public transit, with no guarantee of the expected increase in ridership, in the areas where resources are planned to be shifted. Even with the seemingly frequent restructuring of the system which involves the shifting of resources from one area of the region to another, could to be a major factor for the decrease in ridership on the buses; the restructuring seems to create confusion when riders have to make the necessary adjustments after the changes are made, which creates inconvenience and frustration among riders when an using the system, which, in turn, could result in riders choosing to abandon riding the buses and finding other means of transportation. Mike, thank you for sharing your feedback regarding the Metro Reimagined draft proposal. As you well know, parts of #39 Berkeley-Florissant will be served by #61 Chambers and #67 Redman Patterson routes. Frost Avenue, New Florissant Road, and routing around Hazelwood Central High School will no longer be served. Do keep in mind, while this route is proposed to discontinue, surrounding routes like the #61 Chambers will improve to 15-minute frequencies throughout most of the day. I have a feeling we’re on the same page in terms of the future of Metro Transit in the region – to encourage transit ridership using the current resources available. Through the first draft phase of Metro Reimagined and through countless community engagement, MetroBus frequency was the most requested. Under this current proposal, the frequency of some of the most popular North St. Louis County routes have been reduced to 15-minute frequencies. As someone who uses the MetroBus system on a regular basis, your suggestions are paramount. I’ll make sure your words are forwarded to Customer Service to be included in the planning process. Thank you. I’m confused about the #9 River Des Peres proposed route. Will it actually stop on River Des Peres Parkway? Previously I was told by Metro it was not safe for MetroBus to stop on River Des Peres Parkway (such as at the Weil Avenue intersection) because there are no shoulders / turnouts. Also traffic moves at a very high speed, for which the road was not designed. I like the idea of a stop at River Des Peres and Loughborough, for example; that would be great and much closer for me than the current service of the #17 Oakville (which I think would become the #17 Mackenzie) along Mackenzie Road. Another question about the #9 River Des Peres – does the leg from Catalan Loop south to Telegraph and Baumgartner operate at the same frequency or less often? On the map it almost seems like 2 separate routes. The downside of this plan though is that it eliminates any connectivity to a downtown express route from far South County. Currently you have the #40X that starts at Meramec Bottom and I-55, and it has a transfer opportunity with the #17 at Reavis Barracks and I-55 park-ride lot off Spokane Drive. I occasionally utilize that transfer. With this plan, the Mackenzie corridor will still have that transfer opportunity between the #73X I-55 Express (truncated at Lindbergh), but the #9 River Des Peres will not provide a transfer opportunity for Telegraph corridor customers to get an express bus to downtown — unless you are considering it a viable option for customers to walk almost 1 mile via the Carondelet Connector bike/ped trail from the current #90 (new #9) stop at Germania and Eugene, all the way to the current #40X (new #73X) on-ramp stop near Loughborough and Idaho. I don’t know how else you would connect those routes though given that the off-ramps at Germania and at River City / Carondelet do not connect to one another. Also, I realize the area around Washington University is already saturated with transit service. But I really try to go from one meeting to the next without using a car. And it’s great when students can go car-free too. So I don’t understand why the #2 would no longer serve Schnucks on Clayton Road; and why the #1 would no longer serve the downtown Clayton area including the WashU West Campus. While WashU does currently provide a shuttle for students/employees from the West Campus to Mallinckrodt Center, it does not cover a lot of other important destinations I need to access regularly like Hanley Road in Clayton, Wydown Boulevard, and Fontbonne University, like the #1 does. Also it’s not part of the public transit system, and may or may not continue to be operated by WashU once the East End project is done. And in North County, the #71 ending at Bellefontaine and Chambers doesn’t make sense to me. That’s not a transit center, and you have the Riverview-Hall facility with numerous transfer opportunities only 2 miles south of there, which you could service either via Lilac or via Bellefontaine. Hey Joe, sorry about the delayed response in terms of your thoughts on the Metro Reimagined draft proposal. Before we dive into specifics pertaining to your commute, I want to stress to you that this is indeed a draft plan. We can make modifications. I will forward this feedback to Customer Service to be included in the planning process. The #9 River Des Peres MetroBus route is a new MetroBus route that’ll operate between the Shrewsbury-Lansdowne I-44 Transit Center and Telegraph at Baumgartner. Service between the Shrewsbury Transit Center and Catalan Loop will operate on weekdays every 30 minutes during the day and every 60 minutes in the early morning and evening, and every 60 minutes all day on weekends. Service between Catalan Loop and Telegraph at Baumgartner will operate every 60 minutes all day on weekdays. Service between Shrewsbury Transit Center and Telegraph at Baumgartner will operate every 60 minutes all day on weekends. Under the draft proposal, the #9 Rive Des Peres will have a stop near the intersection of Gravois and Des Peres Parkway. It will cross the River Des Peres and continue south along Germania Street. As for service surrounding Washington University, we have a few changes that’ll improve access to transit in that area. The #1 Gold and #2 Red MetroBus routes will experience improved frequencies, with both routes offering 30-minute frequencies through most of the weekday. In addition, we are bringing the #5 Green Line into the MetroBus family (currently it is served by a Metro Call-A-Ride vehicle). This line will operate every 15 minutes, which will also be the case for the #16 City Limits. These frequencies will compliment MetroLink service, which already brings high frequency service to Washington University’s various campuses. As I mentioned, I’ll make sure to forward your comments regarding improved bus service in South City, in the central corridor and in North St. Louis County. Thank you for your thorough feedback Joe. Carolyn, thank you for providing your feedback on the draft proposal. As you are aware, the #97 Delmar will turn south on North and South Road from Delmar Boulevard. Under the draft proposal, the #97 Delmar will also operate every 30 minutes during most of the weekday. I want to stress that this is still considered a draft plan – modifications can be made. I’ll make sure to forward your thoughts to Customer Service who will include your feedback into the planning process. Thank you Carolyn. When will you know specific on schedules, and when will most of these changes be implemented? John, we expect to pilot a few of the new mobility solutions sometime next year and rollout the service plan in fall 2019. Will the many riders that take the 58X and the 410X to and from the Wells Fargo Campus on Market Street still have easy access to those Routes under the new plan? Tom, under the proposed Metro Reimagined plan, the #58X Twin Oaks Express will be replaced by the #157X Twin Oaks Express. The #410 Eureka Express will be replaced by the new #10 Eureka Express. The #157 Twin Oaks Express will continue to serve the Wells Fargo Campus at Jefferson and Market Streets, providing 30 minute frequencies during peak times of the day. The #10 Eureka Express will also serve the Wells Fargo Campus, providing 30 minute frequencies during most of the day as well. Will there be NFC mobile payments for example Google pay and Apple pay to ride the bus? We are considering this technology, yes. Lara, thank you for providing your feedback regarding the Metro Reimagined draft proposal. The #57X Clayton Road will still provide express service from Ellisville at the intersection of Clarkson and Clayton Roads to the Central West End Transit Center is the Central West End. Preliminary plans call for 30 minute service to operate between 6 a.m. to 7:30 a.m. and 3:45 p.m. 5:15 p.m. Again, specific operating schedules have yet to be finalized. We’ll make sure to forward your thoughts to Customer Service to be included in the planning process. Thank you. Jerry, thank you for reviewing the proposed Metro Reimagined draft plan and for providing your feedback regarding the proposed #59 Dogtown MetroBus route. Currently, the #59 Dogtown operates from Rock Hill to the Central West End Transit Center. As you mentioned, that route will change per Metro Reimagined. Under the draft proposal, the #59 Dogtown will operate from St. Mary’s Hospital in Richmond Heights to the Central West End Transit Center. In addition to a shorter, more direct (and thus faster) route, the #59 Dogtown is proposed to have 30-minute frequencies throughout most of the day (4 a.m. to 7 p.m.) Currently, the #59 Dogtown route operates frequencies between 40-60 minutes. We’ll make sure your feedback is sent to Customer Service who will include it in the planning process. Thank you. Matthew- can you explain why the #59 is going down a residential street (Hoover Ave) and not the more logical route of Ethel Ave? Hoover has 14 homes and 3 small apt complexes on it. It’s a residential street so parking is allowed on both sides of the street. Ethel Ave one block to the north has zero homes on it, parking on only one side of the street due to medical buildings and a parking structure on that side of the street. There’s a parking lot and 3 or 4 apt buildings back from the street on the other side. Hoover Ave should not be a bus route with so many individual homes. Even Wise Ave one block to the south would make more sense since that equivalent block has businesses, parking, and just a couple of homes. Carrie, thank you for providing your feedback regarding the Metro Reimagined draft proposal. We’ve extended the public comment period a little bit into the New Year, so I’ll make sure your thoughts are forwarded to the appropriate department to be included in the overall planning process. Currently, our transit planners are finalizing and tweaking the proposed service plan. Transit planners have proposed using Hoover Avenue rather Etzel in order to be closer to Dale, which is now served by the current #59 Dogtown route. This proposal would catering to riders on Dale who use the #59 route in that area today. That being said, you do bring up a good observation regarding moving the route one block south on Wise Avenue. That’s definitely an options transit planners will consider. Thank you again for your feedback Carrie! Thanks, Matthew. I’d love to know how to have a conversation with the transit planners. Hoover is still blocks away from Dale Ave, so these proposed changes don’t really make sense if the goal is to maintain some of the Dale Ave ridership. I know a lot of people are upset because these proposed changes totally eliminate Dale Ave off the route. The residents on Hoover Ave do not want any type of bus (shuttle or regular size) going down the small, residential street. It’s just not safe or feasible. Thank you for extending the public comments regarding the new plans. agree with the above comments of Jerry and Carrie regarding proposed #59. If there is a demand for passengers to reach Walmart on Dale, would it be possible for the proposed #59 to extend a little bit more and connect Walmart Maplewood to CWE?. It looks like it will not be too much of a stretch (give or take 1 mile). As Carrie mentioned, Hoover is a residential street that is not designed to handle a bus safely as it can barely handle 2 way traffic. Utilizing Ethel may be better if needed as Highland Terrace coming north from Wise is a steep road downhill and could pose a safety hazard to the pedestrians in the neighborhood. However, in my opinion, Highland Terrace is not wide enough to accommodate a bus regardless of size. Bellevue one block east barely can handle bus service in my opinion due to the busy traffic between the 2 buildings of SSM St. Mary’s and pedestrians crossing. Considering these factors and demand for service to Walmart area, would it be possible to just extend the proposed #59 Dogtown to Dale so that passengers can access both Schnucks of Richmond Heights, St. Mary’s hospital and Walmart area of Dale? This would also connect the Richmond Heights City Hall as well. The bus could utilize wider streets such as Clayton road north of Richmond Heights Schuncks and Big Bend, as well as Dale. Liz, we appreciate the additional feedback regarding the Metro Reimagined draft proposal as it pertains to the proposed #59 Dogtown MetroBus route. Do keep in mind, that transit planners must think system wide when configuring a service plan as great as this. Also, Metro Reimagined is being deployed using current operation budget resources, meaning that in order to improve frequency (a highly sought recommendation from riders like yourself) other service elements must be reconfigured. Remember, Metro Reimagined will deliver 13 high-frequency bus routes as opposed to just one that currently operates today. That being said, we’ll make sure your feedback is included in the overall planning process. Thank you for sharing your voice and for being a part of this investment. Danny, under the draft proposal, there will be 15-minute frequencies on S. Kingshighway via the #95 Kingshighway and Chippewa Street via the #11 Chippewa. There will also be 15-minute frequencies on the #10 Gravois-Lindell MetroBus route. I would suggest using Ethel avenue instead of Hoover avenue for Bus #59/59X change. Hoover avenue has cars parked on both sides of the street. This creates a problem for passing cars with one narrow lane. This is a residential street with houses, cars, families, and kids on both sides on the street. Ethel avenue has no houses and parking on the north side of the street, providing a wide lane for traffic. This change would also save money and time with less traffic, delays and 2 blocks less of driving each trip. I would also suggest keeping the route #59/59X on Dale avenue, west of Bellevue to the Brentwood metro center. I see people waiting for bus #59 on Dale avenue each day. You could add Bellevue from Clayton Road to Dale avenue. This would keep serving all people now being served on Dale avenue. and Metro bus parking garage at Dale and Hanley Road. John, thank you for providing your thoughts regarding the Metro Reimagined proposal. Recently, we’ve received lots of feedback regarding this particular section of the proposed #59 Dogtown route. As this is still considered a draft, there may be room to make the modification you propose. I’ll make sure your feedback is forwarded to Customer Service, who will include your feedback in the planning process. Thank you again for your participation. How soon will we heard back regarding our changes that have been suggested by our neighbors and me? Thanks. John, we’ve heard from thousands of people regarding the Metro Reimagined draft proposal. The feedback that we have received has been logged and sent to the planning department for review. We expect to release the final version of Metro Reimagined this spring. Stay tuned. The #2 Red is proposed to serve the St. Louis Galleria under the Metro Reimagined plan. I ride the bus 59 Dogtown. I, as well as a group of regular others, ride this bus to the Brentwood I-64 station. Cutting out this part of the route wold be a huge loss not only to me and these fellow riders, but also to you. I see many people exit the bus while I am coming on, and vice-versa. This is a great stop that is very necessary to many people. Brittany, thank you for providing us feedback regarding the proposed updates to the #59 Dogtown under the Metro Reimagined draft plan. We’ll forward this over to Customer Care for review. Go Ear, thank you for providing your feedback regarding the Metro Reimagined draft plan. As you’ve noticed, we will be bring Sunday service to the #56 Kirkwood Webster route. That’s quite an exciting peace of news for a route that hasn’t seen Sunday service in some time. Across the system, we are making this change. So, for any other routes with current Saturday service, they’ll also get Sunday service under the new plan. Thank you again for providing your feedback! I sent an email message in October regarding the bus route of he new 10X (replacing the 410X) asking what the route would be going into the downtown area . I never received a response. MThe 410X currently goes east bound down Market, turns left on 14th to the bus station, then goes down Spruce where I get off at the Federal Building. I have heard the proposed 10x route goes straight down Olive. This would create about a 5-6 block walk which I am not looking forward to. I understand you hope to pick up new ridersjip but what about your current ridees? I havebeentaking public transportation from the Fenton area for 18 years. What are the current plans for this route. Linda, the proposed route for the #10X Eureka Express (for downtown St. Louis) includes Olive Street, turning one block north on Tucker and continuing down Locust Street and finally ending at the intersection of North Broadway and St. Charles Street near the Federal Reserve Bank of St. Louis. Why is the bus going down Olive in lieu ofMarket Street? There are a lot of riders who work at the Robert A. Young Federal Bukding located at the corner of Spruce and Tucker and a few that work at the post office on Market who have taken the 410X / 10X that your new proposed route is now bypassing. As previously commented, why are you totally ignoring your long term riders in this new route proposal? Linda, originally this express route was redesigned to make a faster, more direct trip through midtown to downtown St. Louis using Lindell/Olive, all while connecting customers to MetroLink at the Central West End Transit Center so that riders employed at the locations you’ve listed would only have short walks to their final destination from the Civic Center Transit Center. However, this past winter as we’ve explored final changes to the plan, we have once again considered running the #10X on Market Street (between Compton Ave. and Tucker Blvd.). Please stay tuned this spring when we get to update the public about these final changes. Can i get some clarification? Will there still be service to Chesterfield City Hall and the Doubletree hotel on Swingley Ridge Rd, and if so how frequent and what route will service it? This is currently served by Route 258, but if the new 58 is not serving Chesterfield Pkwy, would that mean this loses service? Justin, under Metro Reimagined there will no longer be MetroBus service to Chesterfield City Hall nor the Doubletree Hotel on Swingley Ridge Road. The nearest bus route would be the #91 Olive, which will continue to serve the Chesterfield Mall. This route is expected to offer 30-minute frequencies throughout most of the day.